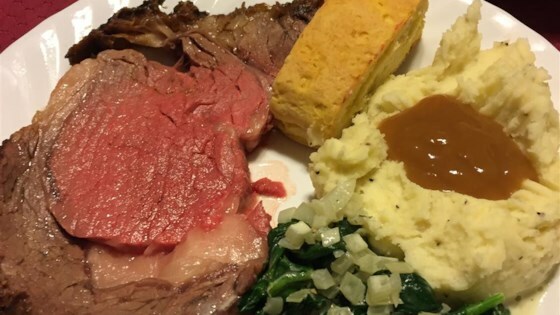 "This rib roast recipe took years to formulate. It makes the most out of this cut of meat. It is perfect for any special occasion." Remove prime rib from refrigerator and allow the meat to come to room temperature, about 3 hours depending on the size of the roast. Preheat oven to 425 degrees F (220 degrees C). Line a roasting pan with aluminum foil. Unwrap the roast and place onto roasting pan; blot with paper towels. Sift together flour, pepper, salt, paprika, onion powder, garlic powder, and celery seed into a small bowl. Coat the roast all over with the flour mixture. Roast in preheated oven until cooked to your desired degree of doneness; about 4 1/2 hours (20 minutes a pound) for medium-rare. Roast to an internal temperature of 120 degrees F (49 degrees C) for medium-rare; 130 degrees F (54 degrees C) for medium; or 140 degrees F (60 degrees C) for well done. When the roast has finished cooking, take it out of the oven, and cover with aluminum foil. Allow to rest in a warm spot for 30 minutes to 1 hour before slicing. See how to make the perfect special-occasion roast. very good recipe, my roast got so many compliments, 'better than restaurant'. first prime rib roast I have ever made.